Yate Cottage01535 649393work Self-cateringYate Cottage is a self-catering cottage adjoining Yate House located in Oxenhope. 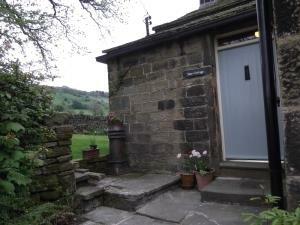 It is an 18thC yeoman's house built in the style traditional to this area of the Pennines. Oxenhope is situated at the head of the Worth Valley, some 4 miles distance from Keighley and 1.5 miles from the Bronte village of Haworth. Oxenhope can be reached from the M62, either junction 27 to bypass Bradford, following signs for Haworth or from junction 26 which passes round Halifax to join A629 towards Keighley. Turn left to Oxenhope at Denholme. From Keighley, take Halifax Road and follow signs to Oxenhope. Yate Lane runs up from P.O. Detailed descritption sent on receipt of balance. Bus service from Keighley Bus Station to Oxenhope. Bus stop opposite post office Yate Lane.